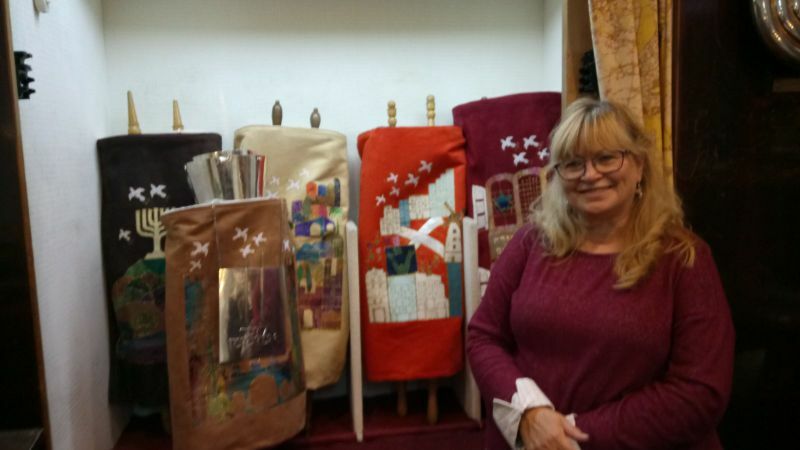 An explanation about our congregation's new Torah covers, by artist Michal Gavrieli, in honor of Har-El's 60th anniversary. I’m so sorry that I can’t be with you physically this evening at this special day of celebration. I promise you that I’m with you in spirit in every moment. When the ark in your synagogue was opened for me for the first time, my breath was taken away from the richness and color that welcomed me. I understood that standing before me was not a simple task. Yet quickly, with God’s help, the understanding of what I needed to do quickly became apparent. Kehilat Har-El is inseparable from the city in which it resides, and so I brought to your congregation Jerusalem and its imagery. This scroll stands at the front of the ark, and so the gates of the entrance to the city stand as guardians of the breastplate in her memory. The modern silver design of the crown and breastplate echo the connection between the ancient history of the city and its traditions spanning thousands of years, and its modern history, aspiring to look forward towards the future. The scroll with the brown Torah cover symbolizes that before Jerusalem became a city, the Jerusalem Hills preceded it. The colorful hills hint to a future time and to Jerusalem’s richness in diversity. The seven branched menorah at the top of the mountains points to “the place that I will show you”, which unify these mountains as a holy place. This bright cover, the color of Jerusalem stone, captures the essence of the Old City, its walls, homes, the Temple Mount and the Western Wall. Gentle golden lines outline the Jerusalem Hills and give a frame for the city. In a powerful orange, bright and bold, sits the new city of Jerusalem, on its many different levels, the streets that cross through it, the windmill, and of course, Kehilat Har-El, with its beautiful tulip garden. Here too the color of the Torah cover projects the vitality of Jerusalem and its strength. And last but certainly not least, the Torah cover in the color of ancient red wine, like the song by Shlomo Artzi: "Preserved like good wine, playing within me a melody like days of old…" It is dedicated to Kehilat Har-El. Its original windows, metal work, wooden shutters, and bougainvillea bush. Inside the windows: the symbol of the congregation, the coat of arms of the city, and the Star of David symbolizing nationhood (and thanks to Shany for the suggestion). In the center you can see the door to the synagogue, with its metalwork and stained glass windows. In the middle, between the two floors is the verse: "Torah shall come forth from Zion, and the word of the Eternal from Jerusalem" which was chosen by the your senior staff as the motto of the congregation. And above all of them, as a motif connecting all of the Torah covers, are white doves of peace. May it be God's will that in the coming years, we may indeed be privileged with peace.